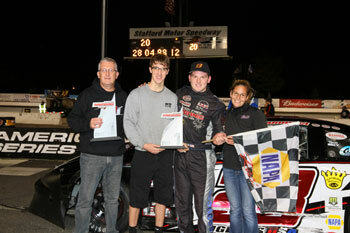 (Stafford Springs, CT)— Stafford Speedway returned to NASCAR Whelen All-American Series racing action with its Final Friday Night Shoot-Out program. The night began with a tribute to Ted Christopher, Stafford Speedway’s all-time winningest driver with 131 career feature wins, who passed away last Saturday in a plane crash while heading to Riverhead Raceway. Taking feature wins on the night were Keith Rocco in the SK Modified® feature, Michael Bennett in the Late Model feature, Dan Wesson in the SK Light feature, Bryan Narducci in the Limited Late Model feature, and George Bessette, Jr. scored his very first win in the DARE Stock feature. 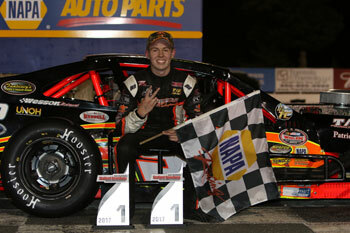 In the 40-lap SK Modified® feature event, the race started with the P1 position left vacant for Ted Christopher. Tony Membrino, Jr. took the lead at the green with Josh Wood immediately applying heavy pressure. As the field hit turn 3, several cars came together and set off a chain reaction that collected Rowan Pennink, Todd Owen, Dan Avery, and Chase Dowling that brought the caution out with 0 laps complete. 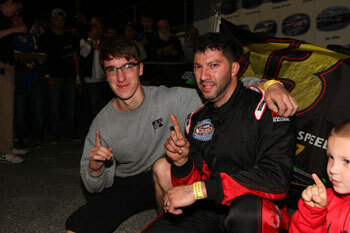 The field took the green with Joey Mucciacciaro, Jr. sliding into the turn 1 wall to bring the caution right back out. Membrino took the lead back under green but he was under heavy pressure as Tyler Hines went to his outside and Wood was looking to his inside. Hines went to the lead on lap-3 with Membrino and Ronnie Williams side by side for second. Membrino took second with Williams now side by side with Matt Galko for third and behind then Glen Reen and Eric Berndt were side by side for fifth place. Tom Bolles spun coming out of turn 4 to bring the caution out with 9 laps complete. Hines and Membrino went side by side for the lead on the restart with Hines taking the lead and Membrino began to slide backwards. Hines held the lead until lap-13 when Williams took the lead. Keith Rocco was on the move after the restart and he quickly worked his way into second behind Williams. Rocco took the lead from Williams on lap-18 while Reen moved up to third with Hines fourth and Wood fifth as the field completed lap-20. Rocco started to pull away from Williams in second who was in turn pulling away from Reen, Stephen Kopcik, and Hines. 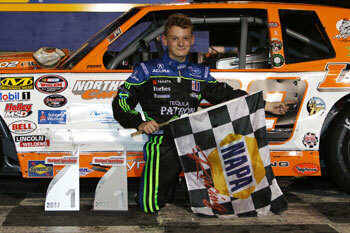 Rocco led Williams to the white flag with Kopcik third, Reen fourth, and Hines in fifth. The entire field pulled down pit road after taking the white flag with Stafford Speedway announcers Ben Dodge and Matt Buckler calling Ted Christopher home as the winner. In the 30-lap Late Model feature event, Kevin Gambacorta led the first lap before Michael Bennett went to the front on lap-2. Tom Fearn was on the move early on as he quickly moved up to second. Gambacorta began to slide backwards and he settled into line in seventh as Mike Wray took third, Mike Quintiliano fourth, Tyler Leary fifth, and Glen Reen sixth. This was the running order when Leary spun in turn 2 to bring the caution out with 10 laps complete. Bennett took the lead back under green with Wray taking second from Fearn. Gambacorta was back up to fourth with Paul Arute in fifth. Fearn began to slide backwards to seventh in line as he was stuck in the outside lane with Gambacorta taking third, Arute fourth, Reen fifth, and Quintiliano sixth. Gambacorta was applying heavy pressure to Wray for second and he was able to make a pass on lap-18. Behind them, Reen moved into fourth and Quintiliano took fifth with Fearn sixth and Arute back to seventh. The order shuffled again on lap-24 as Reen moved into third with Quintiliano fourth and Fearn fifth as Wray fell back to sixth in line as Bennett was in his own time zone out front. Bennett led the field to the checkered flag to pick up his fifth win of the 2017 season. Gambacorta finished second with Reen, Quintiliano, and Fearn rounding out the top-5. In the 20-lap SK Light Modified feature, Bob Charland and Glenn Korner were side by side for the lead at the drop of the green. 2 laps were complete when the caution came out for spins in turn 2 by Cory DiMatteo and Mark Bakaj. Charland took the lead back under green with Wesley Prucker nearly going 3-wide for the lead with Korner and Charland before he backed out of the move. Marcello Rufrano moved up to third with Norm Sears fourth and Prucker was back to fifth. David Arute went around Prucker on lap-5 to take over fifth and up front, Rufrano took second from Korner as Charland continued to lead. Rufrano made quick work of Charland as he powered into the lead on lap-7. Korner was third with Prucker and Dan Wesson behind him. With 10 laps complete, Brett Gonyaw took a hard hit into the turn 2 armco barrier that brought the yellow and red flags out. The cars of David Arute and Korner also had damage and they both an early finish to their night. Rufrano took the lead back under green with Wesson and Prucker side by side for second. Wesson got the better of that battle while Joey Ferrigno was up to fourth and Chris Matthews was in fifth. On lap-14, Wesson made a move to the inside of Rufrano for the lead. The two cars touched and Wesson’s car wheel hopped over Rufrano’s car and both cars kept on racing with Wesson taking the lead and Rufrano settling into second. Prucker was still fourth while Geoff Nooney was up to fifth. After a heat race crash left his regular ride too damaged for the feature, Cory DiMatteo got behind the wheel of Mark Alkas’ car and after starting at the rear was now into the top-5. DiMatteo took fourth from Ferrigno as Wesson took the white flag. Wesson led Rufrano to the checkered flag to pick up his second win of the 2017 season. Prucker was third with DiMatteo and Mark Bakaj rounding out the top-5. In the 20-lap Limited Late Model feature event, Jeremy Lavoie took the lead at the green with Robert Bloxsom, III taking second from Gary Patnode on lap-3. Bryan Narducci followed Bloxsom past Patnode to move into third and Duane Provost got by Patnode on lap-4 to move into fourth. Narducci took second on lap-4 from Bloxsom and Provost followed him through to take third and drop Bloxsom back to fourth. Alexandra Fearn was fifth with Al and Cliff Saunders behind her as Patnode had slipped back to ninth. Al Saunders got around Bloxsom on lap-10 to move into fourth and his twin brother Cliff took fifth from Fearn on lap-11 as Lavoie continued to lead the race with Narducci and Provost giving chase. Matt Clement in turn 1 to bring the caution out with 13 laps complete. Narducci took the lead back under green with Al Saunders taking second. Provost got loose and nearly spun but he was able to get back in line in fourth behind Fearn in third with Cliff Saunders taking fifth. Provost took third from Fearn on lap-18 while Cliff Saunders, Lavoie, and Bloxsom were in the midst of a dogfight for fifth. Narducci led Saunders to the checkered flag to pick up his fourth win of the 2017 season. Provost finished third with Fearn and Lavoie rounding out the top-5. In the 15-lap DARE Stock feature event, Chuck Harrison took the lead at the green with Dave Secore, Jr. moving into second and Brandon Michael took third. Nicole Chambrello and Nick Bendiak spun in turn 3 to bring the caution out with 1 lap complete. Secore charged into the lead on the restart with Michael and Harrison side by side for second. Michael got clear on lap-3 with George Bessette, Jr. moving by Harrison to take third. Johnny Walker followed Bessette by Harrison to take fourth with Mike Hopkins moving into fifth. Harrison slotted into line in sixth place with Secore leading Michael. Walker got around Bessette to move into third on lap-5 and he was applying pressure to Michael for second. Walker took second from Michael on lap-6 but the caution came out for a spin in turn 4 by Gary Spinnato, Sr. which moved Walker back to third for the restart. Michael got a good run on the outside of Secore to take the lead on the restart and Bessette moved into second on the outside of Secore. Secore slotted into third with Walker taking fourth and Hopkins was fifth. Bessette went around Secore on lap-10 to move into second before Harrison spun in turn 1 to bring the caution back out. Bessette used the outside lane to his advantage as he took the lead from Michael on the restart. Walker took third with Secore fourth and Hopkins fifth. Walker took second from Michael on lap-14 and Hopkins was applying heavy pressure to Secore for fourth as Bessette was still leading. 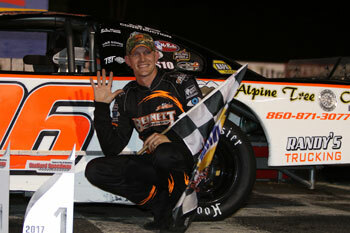 Bessette led Walker to the checkered flag to pick up his first career win. Michael finished third with Secore and Hopkins rounding out the top-5.